Tour Destination: This special itinerary has designed for special interest guest who really wants the colorful part of Odisha. particular tour is covering temple tour of Bhubaneswar, different ethnic tribal village (complete isolated village and also camping) and their weekly market, colorful textile village, boating on chilika lake, Bhitarkanika National park, Puri, Konark- sun temple, artisan village- Raghurajpur and many more. Arrival at the airport of Bhubaneswar meet our representative and transfer to hotel, if time permit visit the ancient cave (2nd century BC) Khandagiri and Udaygiri. Overnight at hotel. After early breakfast departure for Kutia Kondh( tattoo faced) tribal village enroute visit the Kondh tribal village.Upon arrival at Kutia tribe village camping ( tent) and overnight stay at there. Note: Tent and mattresses with food provided by us while in camping. While hiking at their village explore their life style of Kutia Kondh. 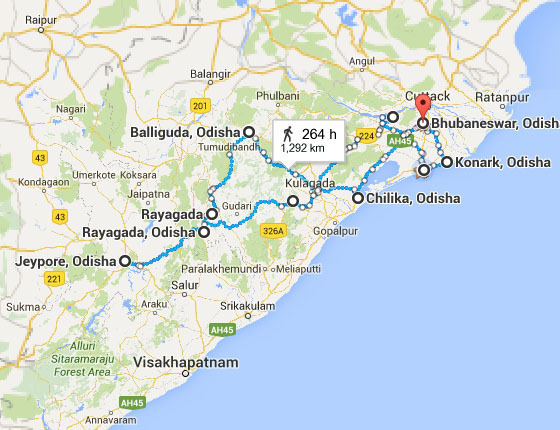 Then drive towards Rayagada and check in a nice hotel and relax. Excursion the jewellery making village and enjoy the jewellery making process call Dokra. Visit the famous ancient Shiva temple of 9th AD. At paika pada.visit the Desia kondh weekly market. Meet the colourful Dunguria tribe Kondh people at their weekly market. While drive towards Jeypore enroute visit the Kuvi Kondh village and Mali village then check in a nice and comfort 2* hotel at Jeypore. Meet the most colourful Bondo tribe at their weekly market at Onkadelly and then after enjoy the gorgeous waterfall at Duduma and explore the life style of Gadhava people at their village and then drive back to Jeypore, afternoon hiking of city tour. Visit the most famous Jagannath temple (non Hindus and camera also allow) at Koraput and visit the largest weekly market of the region at Kunduli famous for Paraja, Mali and rana tribe. While return back to Rayagada visit the Paraja tribal village . check in a clean and comfort hotel at Rayagada. Morning drive towards to Taptapani and enroute visit the Aryan tribe i.e. Saura and visit the hot sulphur spring also. Check in a nice hotel at Taratarini, if time permit walk on the bank of Rusikulya river side for panoramic view. Early visit the famous Taratarini temple on the top of hill ( vehicles are arrive near to the temple). Then after breakfast drive towards puri, enroure meet the migrotary and residential birds in Chilika lake at Mangalajodi while boating on catamaran boat. ( with the boat man). Check in a nice hotel at puri and relax. Morning explore the classical Puri over cycle rickshaw trip to visit the traditional street , old ponds, cremation place and also Jagannath temple-12th AD on the terrace of old of library(because non Hindus’ are not allowed ).also visit the famous Artisan village at Raghurajpur and enjoy the Gotipua classical dance ( arranged by us). After noon visit the famous Konark sun temple (1hr drive from Puri).and enjoy the language of stone of 13th AD. Then return back to Puri and relax. Morning after breakfast check out and departure for Dhenkanal palace- approximately- 150years (the 1st heritage palace of Orissa which has introduced the palace into hospitality line for the guest) enroute visit the 64yogini temple at Hirapur. (the open roofed unique temple which is one of the fourth in India having nice and living condition and all 64 idols are present and the hair style and vehicle of each and every idols are different to other) then drive to famous textile village, Nuapatna ( famous for tie and dye popularly called ikat). Check in the nice heritage palace of Orissa-in Dhenkanal. Enjoy the royal food during evening at their royal dining hall and before bonfire at royal garden. Morning enjoy the royal breakfast at the royal garden then deparute and drive towards Bhitarkanika National Park enroute visit unique sadhus place called Joranda to see the famous worship of Mahima sadhus( monk) having sami naked ( using only tree bark to their lower part and having more than 2 meter of their matted hair). During 10am and sunset time they worship the god of infinity for peace and harmony of the universe. Check in a nice eco resort at Bhitarkanika. After breakfast drive towards to Bhubaneswar and enroute excursion the ancient ruined Budhist University (Mahavihar- stupa- chaitya) at Ratnagiri and Udaygiri. Check in a nice hotel in Bhubaneswar. Morning after breakfast checkout and excurision the ancient temples in cronologycal order from 7th to 11th c AD. Then evening departure to airport for your onwards journey. Note: Now there is no restriction for photography or videography in the tribal market and villages. We are the only tour operator in Orissa to introduce the tent tour ( camping ) in different tribal villages- because we have used the local with us to promote the sustainable tour.